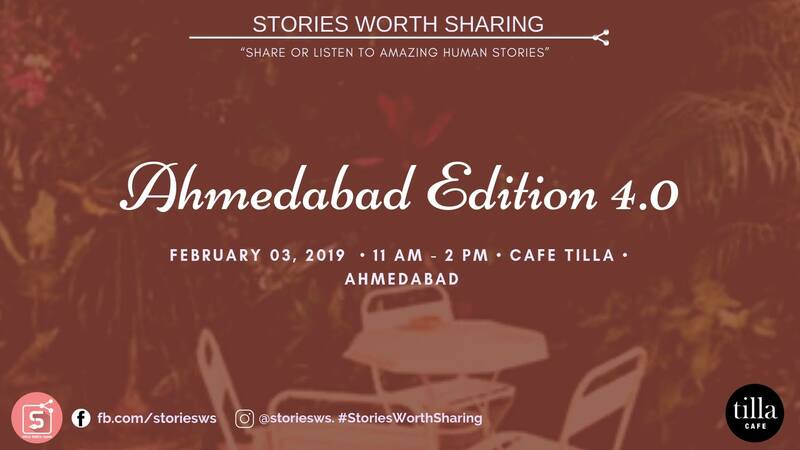 Stories Worth Sharing Meetup is a unique concept of reviving human interaction via personal stories of people which may not have changed the world but changed (their) world. We often find celebrated figures recognized for their stories but commoners like us are left unheard. Here is your chance to be heard in your own city of Ahmedabad. – It is not necessary for a speaker to have an inspirational story, we cherish regular everyday stories. Bringing your friends along? Get them registered! 1. There are only 15 slots for the speakers. 2. Speaker slots are subject to screening and merely registering as a speaker does not guarantee a slot. Speakers will be called 2-4 days prior to the meetup. 3. The story has to be your personal experience and not a fiction. 5. The time limit is 5+1 minutes. At the end of 5 minutes, you will be informed about the time and last one minute is for you to conclude. Kindly respect the time limit and no extension shall be provided to any speaker. 8. By registering with us, the speaker gives the copyright of their story to SWS for publishing and distributing. 9. Speaker slot is a subject to screening, mere registration doesn’t confirm the slot. 10. Ticket once purchased in Non-refundable or Non-transferable.